While the Nintendo Switch, in most respects, is a fantastic handheld/TV combo console, it did require the sacrifice of a few features in order to achieve this hybrid state. One of those details, sorely missed by fans of handheld gaming, has been the D-pad. Until now, the only real alternative on the market has been Hori’s D-pad left Joy-Con replacement – and while officially licensed and solidly-priced for its functionality, it would be nice to have more options available. Shenzhen Jieruihong Electronics Co., Ltd. – a Chinese manufacturing company – saw this opportunity, and is headed in that direction. They recently filed a patent at the end of January in the WIPO’s Global Design Database for a set of Switch controllers. 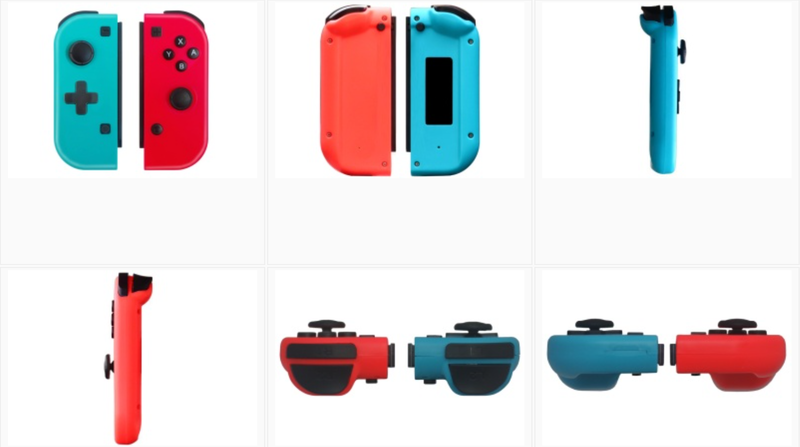 While very similar to Nintendo's original Joy-Con in appearance – including the standard red and blue colours – it very clearly shows that the left Joy-Con features a D-pad. Although we don’t know many other details about this product yet, it will be interesting to see if it includes any features currently lacking in Hori's D-pad Joy-Con – such as motion sensing, vibration, NFC detection, IR sensor, or usability outside of handheld mode. However, this is likely extremely wishful thinking, as the company has previously introduced several Nintendo Switch controllers under the brand name Vigrand – and they have all been relatively cheap, in both price and construction. If these new D-pad controllers do come to market soon, it is probable that we’ll see purchasing options for them on websites like AliBaba, where Vigrand is currently selling their other controller models. Keep your eyes peeled for them. Do you miss having a D-pad while playing the Switch? Have you tried other options currently available on the market? Would you purchase a controller not officially licensed by Nintendo? Let us know in the comments below. The Joy-Con should've cone with a dpad already and shouldn't be a after thought. Kinda surprised Nintendo hasn't offered a D-pad variant yet. I'd imagine playing multiplayer with a d pad instead of face buttons would be extremely uncomfortable. Nintendo should just sell an alternative one separately, hell they can remove the analog stick and place the d pad in that spot to make it cheaper. I purchased a Basstop Controller Housing with the D-pad + Switch toolkit off of Amazon...I have zero experience with that circuitry/electrical engineering/etc and it took me about 1.5 hours to disassemble and put back together. Zero issues so far, plays exactly the same as my original housing, and now I have a D-pad. Definitely recommend. @Bigby013 I have seen those and I'm interested! Which colour scheme did you go for? The white ones with the coloured buttons intrigue me. And this is coming from a guy who's avatar is the disembodied floating head of a half-chicken-half-man offspring. Dont care how they look or that theyre unofficial, if they have sticks that dont have drifting faults I want a pair. Remember de seal of qualidy we dalk about de oder day, if it doesn't had dat den it likely will brick yo console so be careful if you plan do get it someday. Will the 3rd party Joy Cons brick the Switch system ? Can we make a sitcom style theme song about how 3rd party stuff bricks switches? Even if these don't, they look big a bricks themselves. To be honest, I don't need most of the features listed in the article for the faux Joycon such as NFC.. that's only really useful in single player & in that instance I have the official right joycon. Give me a d-pad & wireless functionality & I'm good. Oh and maybe skip the default colour options as we kinda have those already. @MysticGengar Poor Shenzhen Jieruihong Electronics Co.!! Nintendo get flack for the Joycon being too small, and now Shenzhen Jieruihong Electronics Co. are getting flack for their faux Joycon being too big! If the build quality is up there, I’d definitely be interested in a pair. You know what? I've actually become accustomed to the 4 face buttons. Its true that my thumb gets tired way faster, but I never have a problem with diagonals anymore. On standard D pads I'll press say 'up' and 'right,' and get just 'up' or just 'right;' it happens pretty often. With buttons, I can feel both buttons press, instant feedback that can't be missed. That's how i played Celeste, even when I had the Pro controller as an option. A whole lot of ifs in this article. I have the Hori Dpad joycon. I really like it and it performs as well as a Nintendo joycon, its just lighter due to the lack of rumblers and wifi. I like the Hori JoyCon but when I got my FlipGrip I realised the limitation of not having wireless or a battery. I'm not too bothered about the d-pad swapping places with the stick as I leave my Hori JoyCon in all the time and don't change it out between 3D and 2D games (I never need the JoyCon for tabletop multiplayer). @Spudtendo I modded my Joy-Con to have a d-pad (custom white shell) and while it's a bit tougher, it's still fine in multiplayer. I've just bought myself a Pro Controller, well worth it's price in my opinion. not happy with the first party ones. I have 2 switches and both are drifting bad making games unplayable. I just bought the Hori left joy-con. The d-pad on it feels slightly mushy but I love it. To me it feels very much like the d-pad of original the SNES controller. I can finally play platform games on the go now. It's a simple matter of preference. @SwitchForce But a D Pad on the left Joy Con wouldn't work for split Joy Con play. @NintyNate I find the buttons OK for most platform type games but really struggle with 2D fighting games and quick and accurate changes of direction in shmups. @SwitchForce But how could it? Removing the D-pad was the only way the 'anytime 2-player' option that is one of the Switch's core appeals is possible. Without that what would be the whole point of the removable controls at all? @ALinkttPresent D-pad makes sense and is the established term. Nobody calls it a + Control Pad. @ALinkttPresent I've never heard the term +Control Pad. I've heard D-Pad and Directional Pad. That's it. The problem I had with the Hori option is how it isn't a real joycon and there isn't a matching joycon on the right so it looks really bad. This just looks really cheap. They filed a patent for something that is a direct knockoff of Nintendo's design? Really? @WaveBoy yup, gotta rely on pro controller for docked dpad play. Doesn't happen often at my house and when I do play NES on the TV, its normally with my NES classic with the classic controller. As has been said I can't believe Nintendo still haven't offered a D-Pad model of their own. I can't believe we have yet to see switchable (see what I did there) Joy-Con with different button layouts or additional buttons for quirky and inventive games. Maybe they're trying to keep controller options simple after the convoluted Wii era controllers. It doesn't help we've yet to see N64 or GC games on the system. It's a missed opportunity if they don't offer Joy-Con with the classic button layouts if we ever get those games (doubtful tbh) and it was surely a missed opportunity not to offer GameCube layout Joy-Con for use with Smash Bros, although understandably they offered an actual GameCube controller, and avoided the inevitable assumption that GameCube Joy-Con signalled GameCube VC being in the works. But after all that (if you're still reading) I can't quite believe they haven't thought of making Joy-Con that are NES themed for use with the NES games that also include a D-Pad. Yes they gave us the NES controller, but that don't help much if you wanna play handheld away from home. Am I the only one who isn't a fan of the bright, neon red? A D-pad (short for directional pad or digital pad; also known as a control pad) is a flat, usually thumb-operated four-way directional control with one button on each point, found on nearly all modern video game console gamepads, game controllers, on the remote control units of some television and DVD players, and smart phones. Like early video game joysticks, the vast majority of D-pads are digital; in other words, only the directions provided on the D-pad buttons can be used, with no intermediate values. Pro controller is my main controller. I don't really play much handheld, though I'm really not fussed about the lack of d-pad. I thought I would be, but I'm just not. @TTgowings Are you saying that...incase one of us didn't know what a d-pad was, or what? @SwitchForce I agree, but then I think the multiplayer (turning the joycon sideways) aspect would have suffered.. but of course they could have changed the design entirely to make it work. But either way, we already know it should have it (it’s been out for almost 2 full years) what’s the point of still saying it? Just venting? Having a d-pad is great, and essential for many 2D games (of which the Switch has many), but I'd also like to see the right joycon see some attention. Placing the face buttons above the analogue stick requires an uncomfortable claw like grip so as not to be continually hitting the right stick by mistake. Put the buttons on the bottom and the stick on the top. And I used to read the manuals, for shame. @DanteSolablood your must not know right from left. The NFC reader for Amiibos is on the right Joy-Con. But they should come out with a revised version that the left is D-Pad option I think that would give buyers who want one to get a OEM Nintendo version instead of going 3rd party. @SwitchForce As I stated I have my official right Joycon for NFC in single player.